Incorporating regular swimming workouts can be an effective way to cut down on the excess fat you're carrying. Although no type of exercise will help you lose fat specifically from your belly, if you swim at an adequate frequency and intensity in conjunction with a calorie-controlled diet, you'll see fat loss throughout your entire body. Every time you go for a swim, you increase the number of calories you burn that day. That's a big deal because to lose fat, you must burn a greater number of calories than you consume. Therefore, the more often and more intensely you swim, the more calories you'll burn and the greater caloric deficit you'll create. A 3,500-calorie deficit is needed to lose a single pound of fat, and with swimming you have the potential of creating this deficit every one to two weeks. 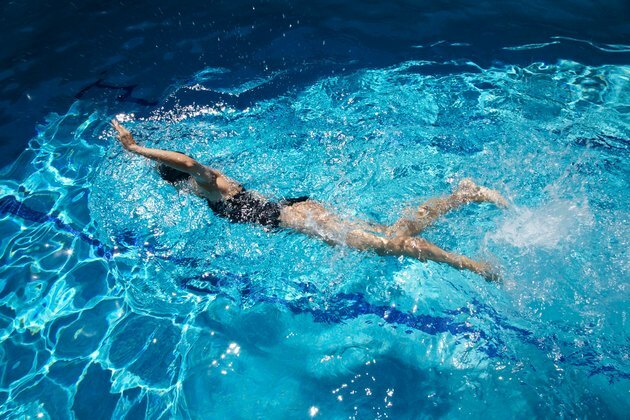 Swimming can be a quality exercise choice for those starting out with activity or for those who are looking to exercise frequently, as it's a non-impact activity that, unlike running, places little stress on your joints. You may be most interested in losing fat at your stomach, but you can't specify where you will lose fat from on your body. That doesn't mean that swimming won't help you lose belly fat. If incorporated with a healthy nutritional plan, it will cause you to lose fat everywhere. When setting out to achieve your fat-loss goal, however, think beyond spot-reducing fat at the belly and instead concentrate on lowering your overall body fat percentage. The number of calories you burn during your swimming workouts depends on how much you weight and your workout intensity. According to Health Status, a person who weights 150-pounds will burn about 414 calories after a 60-minute moderate-intensity swimming session and about 666 calories during a vigorous-intensity swimming session. Someone who weighs more will have to work harder to move through the water and will thus burn more calories. If this 150-pound person does five 60-minute swimming workouts per week, they can burn about 2,070 to 3,330 calories every week. This means they have the potential of losing 1 to 2 pounds per week. While swimming is an effective way to burn a high number of calories, there is evidence that suggests it may not be the best way to lose fat. A 2005 study published in the "International Journal of Sports Nutrition and Exercise Metabolism" found that appetite increases following exercise in cold water, which can cause you to increase your calorie intake and thus not create the caloric deficit needed to lose weight. If you're going to incorporate swimming in an effort to lose fat, pay close attention to your nutritional habits.